Handwriting has played a large role in Krystal Ramirez’s life. During childhood summer vacations to Mexico, she would help her cousin fill up handwriting practice booklets, drawing the letters of the alphabet over and over, the same way each time. Ramirez calls herself an overthinker. Ramirez, 32, is the second artist in residence at Juhl, a downtown condominium complex on East Bonneville Avenue. Her term began Oct. 1, and she’ll spend six months living and working in a ground-floor studio and apartment space at the complex. Ramirez graduated from UNLV in 2009 with a Bachelor of Fine Arts in Art and a minor in Spanish literature. After a few years of bartending around town, Ramirez worked as a commercial photographer and landed a photo job at weekly magazine Vegas Seven. For 2½ years, she has photographed events such as downtown Las Vegas’s Life is Beautiful festival and RuPaul’s DragCon. She’s taken portraits of casino executives and celebrity chefs; she’s featured marijuana growers and tequila distilleries. While describing her mediums, Ramirez struggled to include photography as part of her artistic side, because it’s what she does for a living. But photography was a large part of what she studied in art classes in college. It was a photography class that inspired her to major in fine arts instead of business, the major she entered school with. 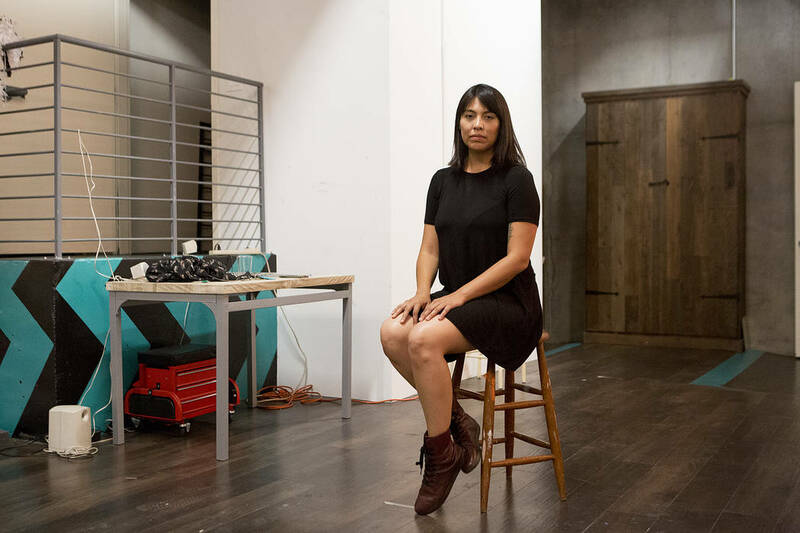 Ramirez’s website features sculptural work from her recent installations at the Clark County Government Center, Gamma Gamma Gallery and Nevada Museum of Art. But it doesn’t contain any of her commercial photography work. Once she begins her residency, Ramirez said she wants to print her photos, something she has not done since college. Ramirez was one of over 30 artists who submitted applications for Juhl’s residency. She was selected by a board consisting of Juhl’s previous artist in residence, Justin Favela; Juhl part-owner Uri Vaknin; art consultant and curator Michele Quinn; and Katie O’Neill, chairman of the board for the Art Museum at Symphony Park. Artists were asked to explain why they want the space, what the space would do for them and their career and how they would contribute to the downtown arts scene. Work created during Favela’s residency is on display at the Denver Art Museum in an exhibit called “Mi Tierra: Contemporary Artists Explore Space,” which features site-specific installations by thirteen Latino artists from across the American West. Ramirez said her first big project is to recreate her 12-by-15-foot piece “I Want to See,” displayed at the Clark County Government Center until recently. The giant banner (which also featured handwriting), made with Bible paper and sewn together with thread, became irreparably damaged during its stay there. The Marjorie Barrick Museum of Art asked if Ramirez would donate the piece to its permanent collection once she’s finished. “You always … or I always think back when I make work like, ‘Oh I should have done this just slightly different,’ or, ‘I love this, but it would have looked better this way,’” Ramirez said. She’s excited to try again. Ramirez also is dreaming up a large crochet piece. She wants to take advantage of as much of the studio space as possible. “I want to try to get away from text,” Ramirez said. “Not necessarily get away from letters or symbols … but definitely from this look,” she said, referring to a picture of some of her previous work. Uri Vaknin, a partner at the company that owns Juhl, created the residency program after meeting Justin Favela at the opening of “Tilting the Basin: Contemporary Art of Nevada.” Struck by Favela’s unique process of creating “paintings” out of piñata material, Vaknin purchased one of his pieces and offered him a spot to live and work at Juhl. This time around, Vaknin said he wanted more “structure” for the residency and created the application process. The residency will continue after Krystal Ramirez’s six months are up on April 1, though Vaknin hasn’t decided what the next call for artists will look like. “I’m going to switch it up every time I think,” Vaknin said. “Next time it might be an invited artist from outside of the state to come here for a shorter period of time.